The Mowbrays, based in Yorkshire and Lincolnshire were one of the richest families in England. They are related to the Berkeley family via Isabel Mowbray, wife of James Lord Berkeley, and mother of his four sons; William (the Waster), Earl Marshal of England, who had no surviving children, Maurice Lord Berkeley, ancestor of the Berkeleys of Berkeley Castle, James (who was killed at the battle of Castillon in 1452), and Thomas of Dursley, ancestor of the Spetchley branch of the family. The founder of the Mowbray family was one Roger Mowbray (d. 1188). The Dictionary of National Biography has two alternative accounts of where he died. He fought on the Crusades and was captured by Saladin along with King Guy of Jerusalem, and subsequently ransomed and released. 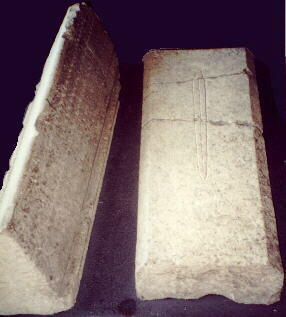 The first version of the story says that he died shortly afterwards and is buried at Tyre in what was then Palestine. The second version, which I prefer, says that he returned home, coming upon a valley called Saranelles, where he found a lion fighting with a dragon. He slew the dragon, and the lion was so grateful that it followed him home to his castle at Thirsk in Yorkshire where he died. It then says that he is buried at nearby Byland Abbey - which he founded. The photo shows two grave covers at Byland supposed to be those of Roger (right) and his mother Gundreda (left). Roger's bears a simple sword motif. The Mowbray crest is a lion rampant, and the crest of Byland is this lion crossed with a bishop's crosier. Byland Abbey was closed by King Henry VIII and now lies in ruins. The site is now run by English Heritage, and is open to the public. I would recommend a visit. There is an account of the founding of the Abbey in A History of the County of Yorkshire. Reading between the lines it would appear that the monks at Byland were a troublesome lot, who seemed to have disputes everywhere they went. Roger de Mowbray and his father, Nigel de Albini, are also associated with Masham, a place famous for the Theakston Brewery and Old Peculiar ale. 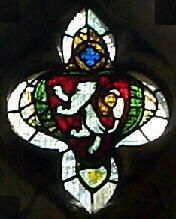 The Mowbray family also left traces in York; their arms appear on the walls of York Minster, and there is a 14th century chapel in the church of Holy Trinity on Goodramgate, which has a Mowbray crest in the window. The family once had a palace on Stonegate, whose name lives on in the corrupted form Mulberry Hall. The lands between the Ouse and Foss rivers called St. George's fields were given by Roger to the Knights Templar. - King Richard II, with Thomas Mowbray and Henry Bolingbrooke. Skipping forward 200 years, we come to Isabel's father, Thomas Mowbray, Duke of Norfolk, who was a supporter of the ill fated King Richard II. His career was the peak of the Mowbray's fortunes, and also ended them. He fell out with the future Henry IV (1367-1413) (their dispute is described in Shakespeare's "Richard II") which resulted in them both being exiled. He died in Venice in the following year, 1399, where (according to Jan Morris' book "Venice") he was buried at the Basilica of San Marco. 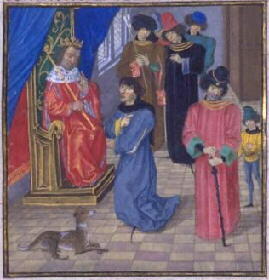 Thomas' story, included the murder of the Duke of Gloucester which he arranged. It is described in detail in Froissart's "Chronicle". According to Froissart, he abducted the Duke with the help of the King, and carried him off to Calais (which he was Governor of at the time). 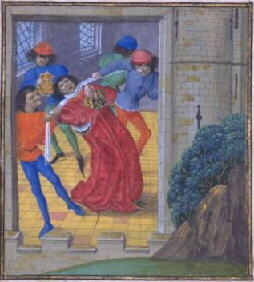 The Duke was then murdered by four knights who burst into his chamber and strangled him with a towel, as shown in the above illustration by Froissart. On the death of his father, Henry Bolingbrooke was deprived of all his estates by Richard. This prompted him to invade England with an armed force. He forced the King to abdicate, and was himself crowned King Henry IV. Richard died mysteriously in the Tower of London shortly after his abdication. Henry was thus the first of the Lancastrian Kings of England; a situation that led directly to the War of the Roses later in the fifteenth century. There is some good background material to this period in "Important Events in the Fourteenth Century"
I found the image to the left over a gateway in Venice. It looks like the Mowbray's rampant Lion crest, but it does not look like it is 600 years old, and the angel is a little too saintly to be anything to do with Thomas. 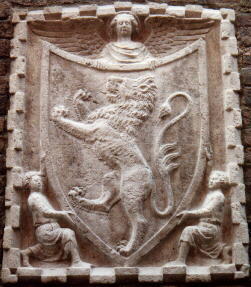 The lion is a common heraldic device. The interesting thing about Thomas and Venice is that the two patron saints of Venice are Saint Theodore, who killed a Dragon, and Saint Mark, whose symbol is the Lion. These two emblems are everywhere in Venice; they must have reminded Thomas of his ancestor Roger. Thomas was just 33 years old when he died. Isabel's brother (also named Thomas Mowbray, and also Marshall of England) joined Archbishop Scrope's rebellion of 1405, which resulted in his execution, and subsequently his head was stuck on a post on Bootham Bar in York, as a warning to others (though Brunton-Knight says that his head was fixed on a stake on Ouse bridge. Her sister married John Howard, and it is the Howards who thus inherited the title of Duke of Norfolk. The Mowbray estate all eventually rested with Ann Mowbray, a seven year old girl who was betrothed to Prince Edward - one of the two Princes reputedly murdered in the Tower of London (see Shakespeare's "Richard III" for a biased account. For an opposing account, why not visit the Richard III museum in York). Anne died a couple of months after the betrothal, and the Berkeley and Howard heirs of Isabel each received half of the huge Mowbray estate. The Howard family are still represented in Yorkshire by the Howards of Castle Howard in Yorkshire, a magnificent palace stuffed with imperial plunder from around the world. It is open to the public - expensive but well worth a visit.